Sakya Monastery of Tibetan Buddhism is ready to receive financial abundance from all sources! Note: All donations benefit Sakya Monastery of Tibetan Buddhism (in Seattle) directly. 1) Make an online donation via PayPal – simply click on “Donate” below. It’s easy, safe and secure. 3) Or call us weekday mornings 8:00 am to Noon. To make a donation on behalf of or in memory of a loved one, please enter the person’s name in the PayPal form or in your letter mailed to Sakya Monastery. Thank you for your contribution to Sakya Monastery. Your generosity makes a difference, helps change lives, and helps to make the world a better place! Welcome to Sakya Monastery’s Shop! To visit the Sakya Monastery Shop in person, stop by after Sunday Chenrezi (around 11:15 am). The shop is open most Sundays. We also have a small online store at Amazon. Use this link to Amazon to buy books published by Sakya Monastery. The link below allows you to buy any other products from Amazon and still benefit the Monastery. Thank you! Sakya Ambassadors are Sakya Monastery members who want to help new people feel comfortable at Sakya Monastery and answer their questions. The Ambassador program was initially formed to welcome people taking Refuge at Sakya Monastery by giving them the opportunity to ask questions and meet Sakya Monastery members in a relaxed, informal environment. After the Refuge ceremony, everyone is invited to go downstairs to the Cultural Hall for tea, cookies and lively conversation. While the Ambassadors are not lamas or teachers, if needed, they can direct people to the correct person to answer their spiritual questions. As with other functions at Sakya Monastery, this program is staffed with volunteers. Please speak with Adrienne Chan, Sakya Monastery Executive Director if you would like to volunteer and help welcome people into the Buddhist life and the Sangha at Sakya Monastery. Children and Youth are welcomed at the Sakya Monastery of Tibetan Buddhism. They are an integral part of the spiritual community and are greatly cherished. The programs for children at Sakya Monastery are created to help support families. They fill an important need that has been expressed by children, parents, and the larger community. The goal of the Children’s Dharma School is to introduce and explore age-appropriate Buddhist concepts and principles, using creative and varied modalities. Different curricula have been devised for younger and older children so that they are engaged and excited about learning. 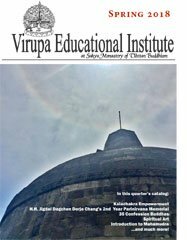 Included are historical accounts of Shakyamuni Buddha, folktales and legends traditionally taught in Tibetan Buddhism, as well as more intensive classes for the older children on such topics as the Four Noble Truths, the Six Perfections and other Buddhist principles. There are exercises to help children develop meditation techniques as well as a variety of art activities. Guest speakers are invited to give the children lectures on special topics and there are occasional field trips, as well as opportunities to learn about other spiritual traditions. Parents may leave their children with the Dharma School while they attend Sunday Chenrezi meditation, or join the children’s classes as assistants or observers. It was the wish of our late, most compassionate Head Lama H.H. Jigdal Dagchen Sakya Dorje Chang that the Teen group at Sakya Monastery learn how to “Be Happy, Make Happy.” Teen Dharma school (founded by Teresa Lamb and Moses Tovar) accomplishes this by studying the teachings of the Buddha and the special prayers & practices of Tibetan Buddhism and weaving them together with the latest sources of information on living a happy life, Teens create the tools to become resilient, empowered, compassionate individuals and to “Be Happy, Make Happy” while meeting the challenges of today’s changing world. We also have guest speakers for special topics, and the very Special ongoing monthly Meditation and Instruction with Venerable Lekshay Sangpo. Please consult the monthly calendar to confirm the meditation schedule. Calm Abiding Meditation ~ Open to the Public. Good for beginners and for developing concentration. For the long life of the Holy Lamas of the Sakya Khon lineage. Guru Puja Practice ~ Open to the Public. Chenrezi Meditations ~ Open to the Public. For the bestowal of numerous Blessings. Ngondro Practice ~ Requires having taken Formal Refuge or Refuge from a Deity Initiation. Removes our obscurations of body, speech, and mind to accumulate merit and wisdom. 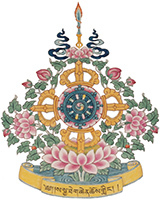 Medicine Buddha Practice ~ Requires Medicine Buddha Empowerment. To alleviate suffering, sickness and injury. For long life, health, protection, etc. White Mahakala Practice ~ Requires the White Mahakala Initiation. Removes material and spiritual poverty and bestows wealth. Vajrayogini Practice ~ Requires a major mandala empowerment or Vajrayogini Initiation. For the memorial of Lamas, the celebration of Lord Buddha’s birth, enlightenment and first teachings please visit our website calendar at www.sakya.org/sakyacalendar.html. These Holy Day Observances are open to the public. When you decide to follow the Buddhist path, it is appropriate to take refuge. Refuge is taken in the Buddha (the Perfect Teacher), the Dharma (His Teaching), and the Sangha (the Accomplished Followers of the Perfect Teaching). There is a formal refuge ceremony in which you receive a Dharma (religious) name. Refuge is offered quarterly. If you are interested or have questions, please contact the Monastery office at monastery@sakya.org or 206-789-2573. In general, when you decide to do a tantric practice (a tantric practice is one in which meditational deities are visualized), you must receive an initiation for that practice. The initiation permits you to do the practice at home and at the Monastery. Some practices have special restrictions, which are explained during the initiations. Receiving an initiation from a lama creates a special bond and commitment. For information on requesting or sponsoring an initiation, please contact the Monastery office at monastery@sakya.org or 206-789-2573.